Serbian History 101 - WWI Serbian Generals-Thanks to "Labud"
WWI Serbian Generals-Thanks to "Labud"
These coins were made in 1988. On the back were the dates 1912, 1914, 1918 and 1988. 4 Marshalls and 1 General by"LABUD"
He was born in Kragujevac, 24. I 1847. He graduated Artillery school there. In Serbo-Turkish wars 1876-1878, as Captain and Major, he commanded Rudnik Brigade in battles on Javor, Veliki Siljegovac, Krevet, Djunis and the liberating of Nis and Pirot. In later operations he commanded Veternik detachment. After these wars he became the Chief of the Standing Army. In the Serbo-Bulgarian war 1885., he was Chief of Staff of the Danube division. He was promoted to Colonel in 1889, and then he became Assistant Chief of the General, and a professor at the Millitary Academy. In 1893., he became Commander of the Sumadija Divisional Region, but he was retired in 1895, because he was suspected for collaborating with Radical party. After the May coup, 1903., he was activated, promoted to General, and became Chief of General-Staff. In the same time, he was Minister of the Army three times: 1904,1906-1908,1912. During this time, Serbian Army was armed with modern weapons, war plans and new doctrines was made. During the Annexation crisis (1908), with his assistant, Zivojin Misic, he made plans for war against Austro-Hungary. In the Balkan Wars, he was the Chief of High Command. He took big part in Serbian victories in Kumanovo and Bitola battles. 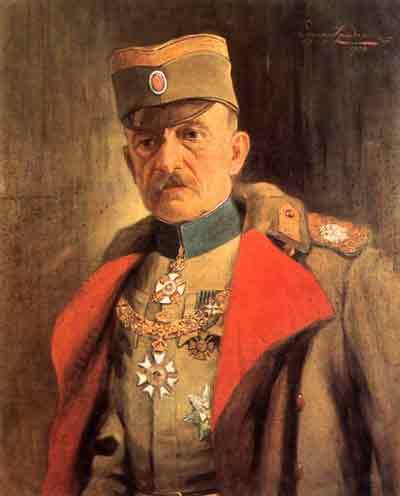 After the Battle of Kumanovo, he became the first Serbian Marshall. In the Battle of Bregalnica, he disposed the Serbian army in the best way to receive Bulgarian attack. In the Great War, he was again Chief of High Command, although he was very sick. He was due much credit in the Serbian victories in 1914 on Cer, Drina and Kolubara. During the Great Retreat, in 1915, he escaped the surrounding of the Serbian Army, although it was attacked from three sides. Old, sick and tired, he resigned in Skadar in December 1915. After the evacuation of Serbian Army, he was sent to Nice on therapy. He died there in 17. V 1917. His body was moved to Belgrade in 1926. He is remembered as the master of a deep and elastic defense. He was born in village of Struganik near Valjevo as the 13th child in family, in 6. VII 1855. When he was sent to school in Kragujevac, his older brother Lazar, was already in Army. He graduated Artillery school as 19. in rank. In Serbo-Turkish wars 1876-1878, he was pupil-sargeant and second liutenant, as commander of company, batallion, and detachment, where he got the Gold medal for courage. In the Serbo-Bulgarian war, he was in rank of Major and commanded the batallion. In the period from 1891-1903 he was professor on Millitary academy, Royal Adjutant and commander of Drina divisional region. As a former Obrenovic adjutant, the conspirators from the Black Hand society who made the May coup, retired him for the first time, in rank of Colonel. In this period, he tried to start a printing business. Because of the hard situation, he was re-activated in 1908 on demand of Radomir Putnik, as his assistant. Then, they made war plans for the inevitable Austro-Hungarian attack on Serbia. He remained Putnik's assistant in the Balkan Wars. After the Battle of Kumanovo, Misic was promoted to general. Anyway, the influence of Black Hand society and the bad treatment of civilian authorities to great generals made that he was the second time retired in 1913. But, as always, in hard moments, in the July crisis, he was re-activated again. He was again Putnik’s assistant, and they realized the plan they made 6 years earlier very successful. In the beginning of the Kolubara battle he became commander of 1st Army instead of wounded Petar Bojovic. He led this battle in the region where he was born. Then, he made, after big arguing with High command, an ingenious and risky thing: he retreated his army very deep, and then, after soldiers have been rest themselves, started great counter-attack, without receiving attack on new positions! Because of that, he was promoted to Marshall (војвода). During the Great retreat, he stayed as commander of 1st Army. In the meeting of army commanders in Pec (December 1915), he was against retreating through Albanian and Montenegrian mountains. Instead of that he proposed the decisive battle on Kosovo. His proposal was rejected, and after evacuation on Corfu, he was retired for the third time, because of this his proposal, which authorities formulated as “treason”. Then he was sent to France on therapy, because he got sick in Albanian Golgotha. Anyway, when he was more needed, in the middle of Bulgarian offensive on Macedonian front in september 1916, he was again re-activated, and led his 1st Army to victory in battle of Gornicevo. 1. VII 1918., he became chief of High Command, and led Serbian Army on its final attack on Macedonian front to liberate the fatherland. After war he was retired for the last time. He died in Belgrade 20. I 1921. He was the most talented Serbian commander ever and one of the most talented commanders in the history. When he got a holiday, he always had gone to his village and helped his brothers in agricultural works. His mother used to call him Beetle (Бубица). He was very popular among the soldiers who call him Blondie (Жућа). He was writing, but didn’t finished his autobiography, called “My memories”. He was born in village of Kumodraz near Belgrade in 12. III 1856. He graduated Artillery school in generation with Zivojin Misic as 1. in rank. For courage and good commanding in Serbo-Turkish wars 1876-1878, he earned Takovo Cross with sword. In Serbo-Bulgarian war he was company commander. Later, he was professor on Millitary Academy and assistant of chief of General-stuff. 1907. he was promoted to general and became commander of Sumadija divisional region. Year later he was Army minister, then commander of Drina divisional region, and Morava divisional region, and then 1911-1912 again Army minister. In liberating wars 1912-1918, he was whole time commander of 2nd Army. In First phase of 1st Balkan war his Army took part in Kumanovo battle. In second phase, he took part with his 2nd Army in siege of Edrine with Bulgarians. In 2nd Balkan war, he successfully defended Nisava valley from Bulgarians. In Great War, he also commanded 2nd Army, which crushed Austro-Hungarians in battle of Cer, the first battle in the Great War. Then, he was promoted to marshal. In battle of Drina, he stoped attack of Austro-Hungarian 5th Army and Combined corps. In Kolubara battle, he gave great resistance to the Austro-Hungarian 5th Army in its attempts to reach river Ljig. In counter-attack, his Army liberated Belgrade. In Great retreat, his 2nd Army slowed down Bulgarian attacks. On Macedonian Front, he took part in battle of Kajmakcalan (1916) and breaking thorugh the Macedonian Front 1918. After the war, he was retired. He died in Cacak 29. IV 1929. In critical moments he had a habit to go in the first lines and fight with soldiers. He was born in village of Misevici near Nova Varos (southern of Uzice) in 16. VII 1858. He was in Serbo-Turkish wars 1876-1878 as pupil of Artillery school in High Command and battery. Then he continued with education, and was promoted to second lieutenant 1880. He became lieutenant in 1883. In Serbo-Bulgarian war 1885. he distinguished himself with courage on Slivnica, Dragoman, Caribrod (today Dimitrovgrad) and Pirot. After that, he was a little time Chief of Staff of the Sumadija division. After the war he was sent to France on further education, then he was company commander and then Chief of Staff of Morava divisional region. 1901, he was promoted to Colonel. Before the Balkan Wars he was Commander of the Brigade, divisional region, assistant of chief of General-Staff and commander of Cavalry division. With his work, he took the greatest part in Serbian victories in battles of Kumanovo and Bitola. Then he was promoted to General. After that he was Commander of Seaside Corps in Albania. In the Second Balkan War he was again Chief of Staff of the 1st Army, which broke the Bulgarian defense on Bregalnica Battle. In the Great War, he commanded the 1st Army. Firstly, he liberated Sabac on 24th August 1914., when he was wounded in the leg. Then his Army took the offensive in Srem. But, because of the second Austro-Hungarian big offensive, he was retreated from Srem, and his I Army took part in Battle on Drina, in the most bloodiest fighting for peak Machkov Kamen. On this position, he was replaced by Zivojin Misic, in the beginning of Kolubara battle, because of his wounds. In the Great Retreat, he was commander of New Regions Troops in Macedonia. He commanded in unsuccessful Kacanik operation in attempt to break thorugh the way through Macedonia for Serbian Army. He became chief of High Command in 1916, after Putnik’s retirement. He commanded Serbian Army in its great victories in Gornicevo and kajmakcalan against Bulgarians. In july 1918, he became commander of 1st Army. In breaking thorugh the Macedonian front on Dobro Polje, he surrounded 2nd and 4th Bulgarian division and then he was promoted to Marshall. He continued with advancing and crushed Germans near Nis.After the war he was retired. In April war, 1941, he was re-activated as nominally Assistant of High commander, but he didn’t have any influence on this war. He died in Belgrade 20. I 1945. He was born in Görlitz 22. VIII 1848. as Paul Sturm. He was German, but some said that he was a Luzica Serb. (Lusatian Serb? MKB) Anyway, he was Second Lieutenant in Germano-France War from 1870-1871. Then he meet Petar Karadjordjevic, the future Serbian King, who was captured France Second Lieutenant, and they became friends. In Russian-Turkish war 1876-1878, he went to Turkey as mercenary, but he stayed in Serbia as volunteer in the rank of Lieutenant. In 1st Serbo-Turkish war 1876-1877 he was batallion commander. In Second Serbo-Turkish war (1877-1878) he was promoted to Captain and Regiment Commander. He stayed in Serbia and “serbed” himself. He just translated his name to Serbian (Paul=Павле; Sturm=јуриш>Јуришић), but he kep his last name Sturm as alias. In the Serbo-Bulgarian war he was Commander of the 6th regiment of Drina division. In 1st Balkan war, in rank of colonel, he was commander of Drina I call division, and in 2nd Balkan war commander of Danube I call division. Then he was promoted to General. In the Great War, he was commander of 3rd Army. In 1914, his Army took big part in Cer and Battle on Drina by keeping back much stronger Austro-Hungarian Armies. In the Great Retreat he also commanded 3rd Army, and in Macedonian front until August 1916. Then, he was retired of some stupid reasons (we have already seen bad treatment of civilian authorities to the great commanders in example of Zivojin Misic). He died in Belgrade on 14. I 1921. Janko Vukotic was born in the village of Chevo near Cetinje in Montenegro on 18.II 1866. He graduated from the Millitary Academy in Modena in 1886. In 1902. he became Colonel (бригадир). In period 1905-1910, he was a member of the government, when he was promoted to General (дивизијар) and Commander of 1. division. He had the title of "Serdar," which was reserved only for the best men in Montenegro. In the First Balkan War he commanded the Eastern detachment in the Metohija and Rashka region. Then he became Chief of High Command. In the Second Balkan war he was Commander of the Montenegro division, which had fought in Bregalnica battle with the Serbian Army. In the Great War, he was in the beginning Chief of High Command and Ckmmander of the Herzegovina detachment. In autumn 1914 he became Commander of the Sandzak Army which together with Serbian Uzice Army made the offensive in eastern Bosnia in September 1914. In the Great Retreat, he succesfuly protected the left flank of the Serbian Army. He suggested King Nikola to retreat Montenegrin Army together with Serbian. King refused his suggetion, and he resigned from all his functions. But he still remained Commander of the Sandzak Army, and lead the Montenegrin Army in the Battle of Mojkovac (January 1916), where outnumbered Montenegrin troops had successfully protected the Serbian Army in its retreat through Albania. After Montenegrian capitulation, he was captured. After the war he was General in the Kingdom of Yugoslav Army. He died in Belgrade on 4. II 1927. He was born in Belgrade 18. XII 1849. He graduated artillery school in Belgrade 1874. In the Serbo-Turkish wars (1876-1878) he was Chief of Staff of the Cuprija Brigade I class. In the Serbo-Bulgarian war (1885) he was in service on the High Command. After that he was Division Commander, Chief of Staff of Active Army, Minister of Defense. In 1902. he was promoted to general, but in 1903., after the May coup, he was retired. He was re-activated in the First Balkan war, when he was Commander of 3rd Army, which liberated Kosovo and, through Albania, came to the Adriatic coast. In Second Balkan war, he also commanded 3rd Army which rejected mighty Bulgarian attacks in battle of Bregalnica, but he didn't use all opportunities in counter-attack. In the Great war he was chief of Montenegrian High Command. After Montenegrian capitulation, he was in Serbian High Command. He died in Herceg-Novi on 7. VII 1920. He was born in 1856. In the beginning of Great war, he was Commander of 6th French Corps, and in battle of Marne he was Commander of 3rd Army. In 1915., he became Commander of French Eastern Army, which failed to help Serbian Army in the Great Retreat and made possible retreating though Macedonia. Until Decembre 1917, he was commander of all Allied forces on the Macedonian front. After the war he was commander of French forces in Syria. He died in 1929. He was born in Mostaganem in what is today Algeria, on 25. may 1856., the son of an officer of cavalry in the Chasseurs d'Afrique. He was educated at Saint-Cyr and graduated in 1876. He served in French Indochina, China (against the Boxer Rebellion in 1900 during which his cousin the German plenipotentiary Klemens von Ketteler was killed) and Morocco before 1914. In 1914, Franchet d'Espérey did well as an corps commander at the Battle of Charleroi, and as result he rose rapidly through the ranks during the war. On the eve of the First Battle of the Marne, Franchet d'Espérey was given command of the French Fifth Army. 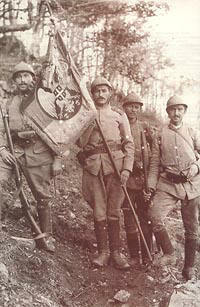 By March 1916, Franchet d'Espérey was in command of the Eastern Army Group and by January 1917 the Northern Army Group. He was badly defeated by the Germans at the Battle of Chemin des Dames in May 1918. He was removed from the Western Front and appointed commander of the Allied armies at Salonika. Between September 15-29, 1918 General Franchet d'Espérey, in command of a large army of Greeks (9 divisions), French (6 divisions), Serbians (6 divisions), British (4 divisions) and Italians (1 division) - staged a successful offensive in Macedonia that knocked Bulgaria out of the war, by plan made with Serbian High Command. General Franchet d'Esperey followed up this victory by overrunning much of the Balkans and by the war's end, his troops had penetrated well into Hungary. During this final campaign, he was given the nickname "Desperate Frankie" by the British officers. After World War I ended, General Franchet d'Espérey directed operations against the Hungarian Soviet Republic in 1919. He was made a Marshal of France on February 19, 1921, and was given a honorary title of Vojvoda (equivalent of Field-Marshal) from the Serbs. He represented France at the coronation of Haile Selassie of Ethiopia in Addis Ababa on November 1, 1930. He was elected to the French Academy on November 15, 1934. He died in Albi, on 3 July 1942. Ernest Nygard (aka the "vikingcelt") was looking for information on the Serbs during WWI, and Labud quickly answered the call. "WOW!!! Thank you Labud!!! I really appreciate your help!!! The Serbian people were so courageous, they lost more people per capita than any other combatant in WWI. All they wanted was freedom from the oppression and encroachment of the bully state of Austro-Hungary - they initially kicked their Austro-Hungarian ___ very well. A-H needed help from Germany and Bulgaria to fight them, then it was like 3 to 1, ganging up on Serbia - what could they do? But they perservered to the end!!! Looks like you have lots of stuff about Serbia - I am grateful for your help Labud!!!" I'm a history student, especially interested in Serbia's liberating wars 1912-1918. This is one of the most appreciated parts of our history, so we have many literature written about it. Almost every Serb has got one forefather who fought in the Great war. 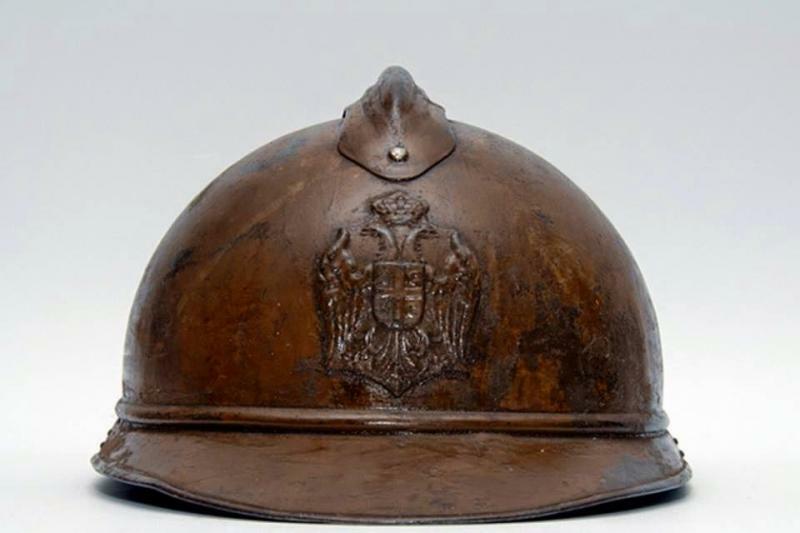 If you are interested, there is movie about Cer battle, March on Drina"
"I have many books here about Serbian Army during Great War, but I need time to translate it from Serbian and then I'll post some information." What "Labud" wrote about the Serbian Air Force in WWI is most interesting, especially the name of the plane. "Serbia is a country with great Air Force traditions. She was one of the first countries with air forces as independent branch of arms. First air victim in history was Serbian pilot Mihajlo Petrovic (Михајло Петровић), who died during the siege of Skadar (srb. Скадар, alb. Shkodra) in 1913, when his scout plane was broken and he fell down. This fear of Ausro-Hungarian planes, who bombed Serbian towns, disappeared when Serbian artillery soldier Radoje Ljutovac (Радоје Љутовац) shot down one plane with his cannon in October 1914. It was first plane shot down from earth. After that, all Serbian soldiers began to shoot at planes with their rifles. Soon, it was forbidden because, they could shoot down Serbian planes. In 1915. Serbian Air Forces had task to scout movings of hostile troops on line Smederevo - Golubac on Danube. On Sava and Danube from Belgrade to Smederevo there was French squadron. After the Great Retreat, the Serbian Air Force was destroyed. On the Macedonian front, the Serbian Army got new planes which took their part in battles on this front, and finaly in liberation of Serbia. Plane "Oluj" (Storm) in 1914. Click bottom right hand corner to enlarge photo. 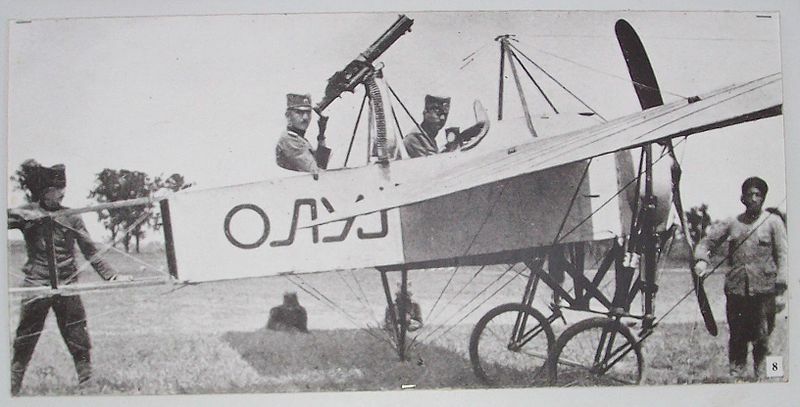 This photo shows the first armed airplane of the Serbian Army in 1915. The airplane is Bieriot X1-2, the pilot is Tomic, and the observer is Mihajlovich.